Privacy Statement of SQT Training Ltd.
SQT is committed to collecting, processing, storing and destroying all information in accordance with the General Data Protection Regulation (GDPR), Irish data protection law and any other associated legal, accreditation, or regulatory body rules or codes of conduct that apply to our business and / or the information we process and store. This privacy notice outlines the policy of SQT Training Ltd. concerning the Personal Information (as defined below) it collects and processes. This notice explains how SQT collects, uses and shares your personal data. It also explains your rights in relation to the personal data we hold. Any questions regarding this privacy notice and our privacy policies and practices should be sent by email to info@sqt-training.com or by writing to SQT Training Ltd, Callan Centre, National Technology Park, Limerick, Ireland. Alternatively, you can telephone 061-339040. The registered address is Callan Centre, National Technology Park, Limerick, Ireland. in order to fulfil contractual and educational obligations. In the case of SQT staff, information is collected for the purpose of recruitment, selection and employment matters. SQT holds personal data in order to implement and manage services & processes relating to your learner recruitment, admission, registration, teaching & learning, examinations, and other support services. Without this information, SQT would not be able to provide its services. SQT only obtains & processes information required for these purposes. SQT shares information internally and with Tutors for operational reasons only as is necessary & proportionate for the purposes intended. What type of information is collected from you and processed by SQT? The right to object – you can object to the processing of your personal data by the organisation in certain circumstances, including the sending & receipt of correspondence relating to upcoming courses etc. The right to object to automated decision making & profiling. SQT does not currently make decisions affecting students by automatic means without human intervention. How long do SQT retain personal information? SQT are committed to the principle of lifelong learning and we recognise that our learners may need our support into the future. We retain basic learner data indefinitely should learners require proof of education for the purposes of employment or further education at some date in the future. Individuals can request to be removed from our records by contacting info@sqt-training.com. While basic data is retained, other data such as feedback forms, assessments, booking forms etc. are deleted. A retention schedule is maintained. You have a choice about whether or not you wish to receive information from us. If you do not want to receive information regarding training and career advice you can select your choices by ticking the relevant boxes situated on the enquiry form, course booking form or on the course assessment form which is completed at the end of each course. We will not contact you with such information unless you have given your prior consent. You can change your communication preferences at any time by contacting us by email: info@sqt-training.com or by telephone 061-339040. The accuracy of your information is important to us. You have the right to ask for a copy of the information that SQT Training Ltd hold about you. 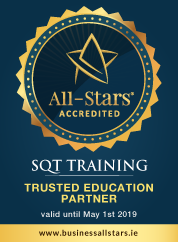 If you change email address, or any of the other information we hold is inaccurate or out of date, please contact us via email to info@sqt-training.com or by writing to SQT Training Ltd, Callan Centre, National Technology Park, Limerick, Ireland to make the request. Alternatively, you can telephone 061-339040. SQT presently offer a number of programmes which are certified by organisations based outside of the EU, namely, AEE (Association of Electrical Engineers) and the Food Safety Preventative Controls Alliance (FSPCA). Personal information is required to register and become certified by these organisations, these are clearly stated on the relevant application form. We keep this Policy under regular review. This Policy was last updated on 28th June 2018 and will be reviewed on a biannual basis or before then if required.